One of the many great things that has come out of the rise of the orchestra-own-brand recording label has been the growth of artist-led recordings. Now an orchestra can showcase itself, or a particular conductor or soloist, without being the slave of the label’s A&R schedule, and that is something to be celebrated. 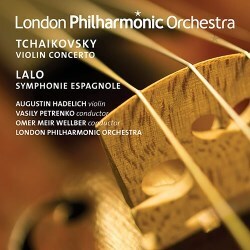 At first glance, this LPO Live release might look like an opportunity to showcase the formidable violin playing of Agustin Hadelich, but on closer inspection things are a little more complicated than that. Importantly, Hadelich’s performance of the Tchaikovsky concerto is very good, as captured here. He plays the first movement with lyricism, beauty and a lovely sense of flow; at least, that is, until the cadenza, which is impressive but a little cursory, and, in fact, the last section of the movement sounds a little more detached than the rest. The Canzonetta is effective, however, and the finale is full of energy. That got me wondering, however, whether in actual fact the real reason for the concerto’s success isn’t so much Hadelich as Petrenko. This shows him in a rare appearance with a British orchestra beyond Merseyside, and Petrenko, who is already a proven Tchaikovskian, shows just as much affinity for the Violin Concerto as he does for the symphonies and the (in my view slightly less successful) Piano Concertos. The great lyrical sweep that propels the first movement comes mostly from his baton rather than Hadelich’s bow, and the gentle sense of interplay between soloist and orchestra in the slow movement is, surely, thanks to the conductor’s sense of balance more than anything else. That was confirmed when I head the Symphonie Espagnole, which is played here with a different conductor. It sounds rather heavy and lumpen, with a first and a third movement that sound clumsy and overweighted here. The second movement is only slightly lighter, but the slow movement broods darkly, sounding much more morose, surely, than Lalo ever intended. None of this, it’s important to say, is thanks to Hadelich, who performs all the necessary acrobatics with great aplomb, and who sparkles wonderfully in the finale, especially. The whole work feels too earthbound, though, with little sense of flight to it, and not once did the piece sound especially Espagnole, to me. So this CD did turn out to be a celebration of an artist but, to my surprise, that artist was Vasily Petrenko.